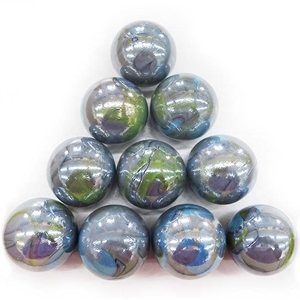 These Thunderbolt marbles have an opaque grey base with swirls of blue and green on the surface of each marble. They are iridized to have an extra shiny reflective surface. They measure approximately 1 3/8 or 35mm and are sold in packs of 10 or 50 marbles. Sizes and colors may vary slightly.